The 6'4" soph guard has emerged as the team's goto player, especially with F Eugene Omoruyi out indefinitely with a dislocated kneecap. Unfortunately for the Knights Baker doesn't get to the line much as is quite an inefficient scorer so it's probably better just to make him beat you by himself. Does Thomas Allen draw Baker? Probably not because him guarding Montez Mathis makes more sense. He's started to prove himself as one of Nebraska's better defenders. With Omoruyi out Ron Harper Jr slides in at the SF position. Rutgers almost always has a traditional center on the court and at times a traditional PF. Doorson is efficient with the ball and a terrific rebounder but isn't an overly aggressive scorer and is turnover prone. Shotblocker but foul prone. A career 34.5% FT shooter! Mathis is a highly regarded Palmer type guard out of Maryland that Rutgers beat out a lot of teams to land. Currently a poor shooter from the outside, Mathis is a slasher who excels at drawing contact. 6'6" Fr Caleb McConnell is the backup PG. Has been a mess of turnovers and bad shooting. He is tall, though. 6'10" 255# Myles Johnson is a less effective Doorson though a better FT shooter. The Skinny: This is one of those games against a not-so-great opponent in Rutgers without one of their best players where you wonder if Nebraska shows up which is probably what happened to Ohio St at the RAC a few weeks back. If you want to take a silver lining from the Michigan St loss it should be motivated to win. Offensively there are lots of places to attack this Rutgers defense that has been gouged during conference play. If you recall Isaiah Roby abusing Lamar Stevens trying to guard him on the perimeter, Rutgers rolls out two guys like this who have to guard both Copeland and Roby. If either is hitting Nebraska should have enough offense in this game. Also add on James Palmer probably able to draw contact when he needs/wants to and we haven't even mentioned Watson/Allen. For a team as desperate for offense as Rutgers there will be offensive rebound opportunities if Nebraska wants to hunt for them. If Nebraska shows up on one side of the ball, that should be enough. If they don't show up at all, this could be one of the biggest upset wins of the Pikiell era. One of those games you have to worry about IF we are still looking back at Michigan State and/or looking past Rutgers to our next game and/or we shoot the ball as poorly as we did against Michigan State. I anticipate with our veteran team that we will bounce back and play an efficient and effective game tonight. Let's get it done men! WHOA...I'm calling foul on this. 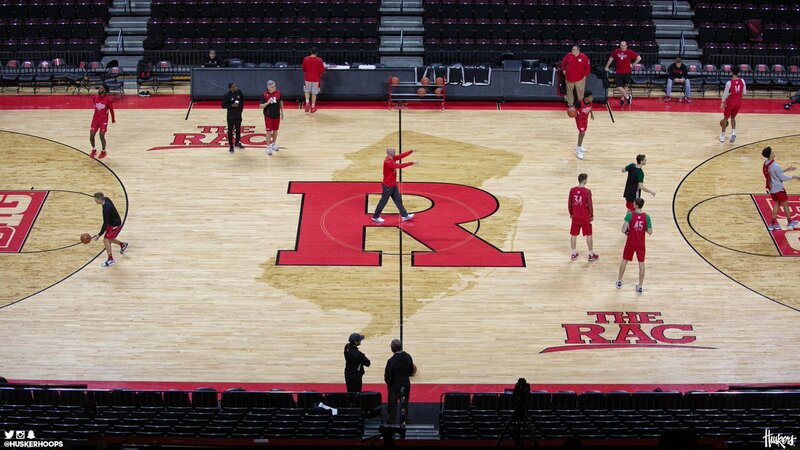 Somehow, @hhcmatt, five hours before tipoff, got a picture of Rutgers' arena 10 minutes before tipoff tonight. This is either witchcraft or some sort of jedi power that the rest of us could only dream to possess. I'm guessing the atmosphere tonight will only be marginally better than a funeral for a loved one that wasn't very well loved. I'm﻿ guessing the atmosphere tonight will only be marginally better than a funeral for a loved one that wasn't very well loved﻿. Did her name happen to be "Xfinity Center"? What a poor, lonely, soul she was.